used 4 ply acrylic yarn. There is also a pattern for small cake plates. 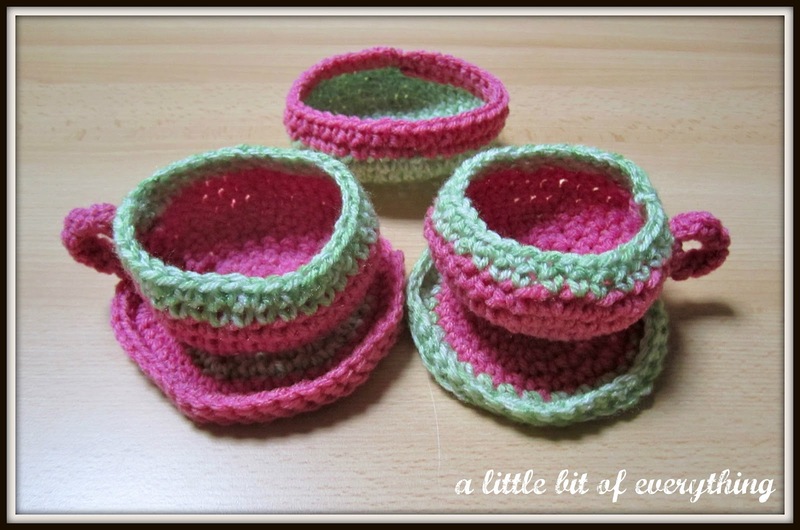 These crocheted teacups and saucers are really cute. I can crochet and used to do a lot of crocheting with my twin sister. I did not try many things but I should really give it a go again in the near future and try something like this. Thanks for sharing this great idea on Creative Monday. I'm a new follower from the linky party (Clairejustine & Judy). This is very cute. I'll be happy if you stop by my blog. I love these!! :) Super smart for a small child that is too young for the ceramic ones! Very cute and I love the bright colors. Thanks for linking up to Making Your Home Sing Monday! sooooooooooooooo cute!!!!! pinning immediately. thank you! super cute! new follow from the hop, would love a follow back. My girls would love making these! They are beginning to learn crochet, so maybe it will be an inspiration to them. :) Thanks for linking up to Simply Sensational Tuesday! I love these!! So cute!! I wish I could make something, anything that's even remotely as cute as these are!! How cute! What a fun thing to make--and wouldn't these be adorable for a tiny girl's tea party? These are so cute!! Thanks for sharing them, what a great idea and easy storage for kids tea parties. Please stop by http://sassyshoppperreviews.blogspot.com/ when you have time! That is so cute! A lot of work too, I'm sure...Happy Friday to you! Thanks for linking up to Lovely Things Thursday! They are adorable! Hi, I'm Jaime. I run a blog called The Dress-up Drawer and I was just passing through. Love your blog and these are adorable! My first time to see a tea cup like this. I think they are so cute. That is cute! I posted the picture on pinterest!